The NYS Writers Institute's Ingmar Bergman Centennial Film Series presents a screening of THE BEST INTENTIONS at 7 p.m. Friday, November 30, at Page Hall, 135 Western Avenue, Albany, on the University at Albany's Downtown Campus. The event is free and open to the public. THE BEST INTENTIONS, written by Bergman, is based on his account of the courtship and marriage of his parents and their struggles with sickness, infidelity, class conflict, and religious faith. It was directed by Bille August and stars Samuel Fröler, Pernilla August, and Max von Sydow. The Variety review called the film "an epic story of mismatched love shaped in the most intimate terms" that "packs a sustained emotional wallop that lightens its three-hour span. "The Washington Post review called it "a moving, profound requiem to all human relationships." The Writers Institute screening is the 3-hour theatrical version of the 5½ hour teleplay. 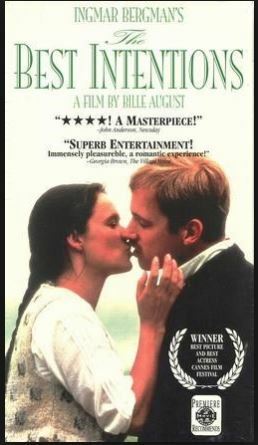 In its condensed form, THE BEST INTENTIONS received the Palme d'Or, the highest prize at the Cannes Film Festival in 1992. There will be a brief intermission at approximately 8:30 p.m. during this screening. The Ingmar Bergman Centennial Film Series marks the 100th anniversary of Bergman's birth (1918-2007). A giant of world cinema, Bergman directed 54 feature films and 129 stage productions. He is often compared with other founding figures of modern art, including Pablo Picasso and Samuel Beckett. His films frequently explore mortality, sickness, insanity, sin, betrayal, grief, and faith. ""For a good quarter century - beginning with his burst into world movie prominence in the '50s and extending until his official 'retirement' after making FANNY AND ALEXANDER in 1982 - Bergman defined serious cinema. He earned consecutive Academy Awards for best foreign film in 1961 (THE VIRGIN SPRING) and 1962 (THROUGH A GLASS DARKLY), another in 1984 (FANNY AND ALEXANDER). Three times, he was Oscar-nominated for best director, five times, as author of the best original screenplay, and the Academy also gave him the Irving G. Thalberg Award for career achievement - the only foreign-language filmmaker to receive it." In 1972, two of Bergman's films, PERSONA (1966) and WILD STRAWBERRIES (1957), were included in the British Film Institute-published magazine Sight & Sound's once-a-decade prestigious poll of critics as two of the 10 greatest films of all time. Previous Writers Institute screenings in this series included THE SEVENTH SEAL (1957) and CRIES AND WHISPERS (1972). For more information, contact the NYS Writers Institute at 518-442-5620.